Ryder Cup 2018: Europe's wildcard picks - who would you choose? BBC Sport has chosen 10 players who could be in the running, and now we want you to cut it down to the four who should make the plane to France.Simply rank your players in order of preference below and BBC Sport will reveal the results on Wednesday, 5 September before the official team announcement at 1400 BST. Ian Poulter: The Englishman has already summoned some Ryder Cup spirit this year after staging a remarkable comeback to qualify for the Masters via a play-off. An injury meant he was involved as a vice-captain last time out. The 42-year-old, who has lost just four of his 18 matches and is unbeaten in the singles, has been involved in five Ryder Cup wins since making his debut in 2004. Sergio Garcia: The 2017 Masters Champion has won 22-and-a-half Ryder Cup points, playing in eight editions of the biennial event. 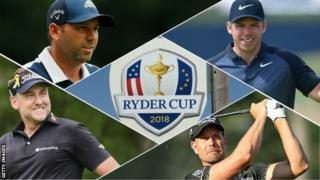 But the 38-year-old Spaniard has struggled for form this year, missing all four cuts at the majors and failing to qualify for the PGA Tour's FedExCup play-offs for the first time.Henrik Stenson: The Swede has played in four Ryder Cups and holed the winning putt on his debut at The K Club in 2013. The 42-year-old has registered top-six finishes at both the Masters and US Open in 2018, but has slipped out of the world top 10.Rafa Cabrera Bello: The world number 29's best performance this year is tied for third at the WGC Mexico Championship, although he did finish in the top 10 at the last of the year's majors, the PGA Championship. The Spaniard won two-and-a-half points from his three matches at Hazeltine in 2016.Thomas Pieters: The Belgian impressed on his Ryder Cup debut in 2016, scoring four points - a record for a rookie - and forged a great partnership with McIlroy. The 26-year-old finished tied for sixth at the PGA Championship in August.Russell Knox: "Welcome to the conversation," said captain Thomas Bjorn to Knox after the Scot won the Irish Open earlier this year to put himself in contention for a first Ryder Cup place.Eddie Pepperell: A first European Tour win at the Qatar Masters in February proved the beginning of a strong run of form for the Englishman, who is hoping to compete in his first Ryder Cup after enjoying a top-six finish at The Open.Matthew Fitzpatrick: The Englishman was unable to get off the mark in two matches on his Ryder Cup debut in 2016. His best finish on the European Tour this season was tied for third in Abu Dhabi in January.Paul Casey: The Englishman is eligible for selection again after ruling himself out in 2016 by declining to rejoin the European Tour. He missed out on a wildcard in 2010 despite being seventh in the world, but was part of victories in 2004 and 2006 before contributing just a half point at Valhalla a decade ago.Matt Wallace: What better way of showing your credentials by winning the final qualifying event before the Ryder Cup? That's what the Englishman did in Denmark on Sunday for his third European Tour win this season. Who should go the Ryder Cup?